Hauling liquids in tanks requires special skills because of the high center of gravity and liquid movement. See Figure 8.1. High center of gravity means that much of the load’s weight is carried high up off the road. This makes the vehicle top-heavy and easy to roll over. Liquid tankers are especially easy to roll over. Tests have shown that tankers can turn over at the speed limits posted for curves. Take highway curves and on ramp/off ramp curves well below the posted speeds. Liquid surge results from movement of the liquid in partially filled tanks. This movement can have bad effects on handling. For example, when coming to a stop, the liquid will surge back and forth. When the wave hits the end of the tank, it tends to push the truck in the direction the wave is moving. If the truck is on a slippery surface such as ice, the wave can shove a stopped truck out into an intersection. The driver of a liquid tanker must be very familiar with the handling of the vehicle. Some liquid tanks are divided into several smaller tanks by bulkheads. 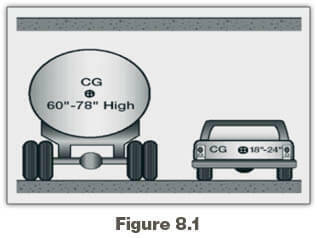 When loading and unloading the smaller tanks, the driver must pay attention to weight distribution. Don’t put too much weight on the front or rear of the vehicle. Baffled liquid tanks have bulkheads in them with holes that let the liquid flow through. The baffles help to control the forward and backward liquid surge. Side-to-side surge can still occur. This can cause a roll over. Un-baffled liquid tankers (sometimes called “smooth bore” tanks) have nothing inside to slow down the flow of the liquid. Therefore, forward-and-back surge is very strong. Un-baffled tanks are usually those that transport food products (milk, for example). (Sanitation regulations forbid the use of baffles because of the difficulty in cleaning the inside of the tank.) Be extremely cautious (slow and careful) in driving smooth bore tanks, especially when starting and stopping. Never load a cargo tank totally full. Liquids expand as they warm and you must leave room for the expanding liquid. This is called “outage.” Since different liquids expand by different amounts, they require different amounts of outage. You must know the outage requirement when hauling liquids in bulk. 8.2.7 – How Much to Load? The amount the liquid will expand in transit. The weight of the liquid.